Perfect size for our bed and light enough. Just what I wanted. It drapes onto the floor at bottom corners. Add color to your traditional space with the Madison Park Stanton Bedspread Set. The soft blue is accented with large quilting in a medallion pattern while a large ivory border makes a statement on your bedding. Two decorative pillows complete this collection with embroidery and fabric manipulation ion corresponding colors to the top of bed. Set includes one bedspread, two shams, two decorative pillows. I am very pleased with my purchase of this bedspread. I have a white-painted wood bedroom set and the white border of the bedspread is a great accent. The stitching in the design part of the bedspread has a few errors but it doesn't detract from the overall beauty of the set. It is more taupe than beige. 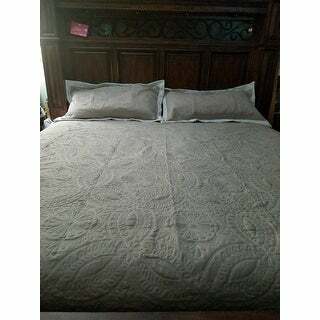 I bought the king size for my queen bed and it works great as a full size bedspread. I would highly recommend this bedspread. It is wide and long enough so that you won’t have to have a bedskirt. It gives a lovely soft traditional look. MUCH nicer than I anticipated! Substantial weight, great stitching on both sides. Looks very elegant, but it's washable!! Very pleased. This is beautiful but very long. It covers the whole bed well. Beautiful, my husband and I both love it. I like the size of the king spread. It hangs over the entire bed. I like the color and I enjoy seeing the pattern on my bed. The pattern is well sewn over the entire bed spread. The pattern has loops, leaves, circles. The pattern flows evenly from one pattern to the next. flowers and flowers inside of flowers. The thread is not popping throughout the pattern which is a plus. The embroidery thread is a satin white and silky thread and looks very nice against the Khaki background of the spread. I love the light cream-colored contrast boarder. For king size the spread is just right in weight, not heavy at all. It is soft and both cool or warm when you need it. I did not like a stain and small spots that I hope will come out in the wash. I had pillows on my bed. That hid some of the spots. I would buy again and I would like more colors. Great quality and perfect size for our Sleep By Number King bed. We have a higher bed and couldn't find an oversized bedspread in the stores. I'm going to add color with decorative pillows. I love this bedspread! It's thicker than I thought it would be but is perfect for all seasons (although I'd add another blanket during winter). I have a ranch and you can see my bed from the living room, so I love looking at it. And it's so pretty! I make my bed every day now! This spread is beautiful. Got the taupe one and it reverses to a creamy white. 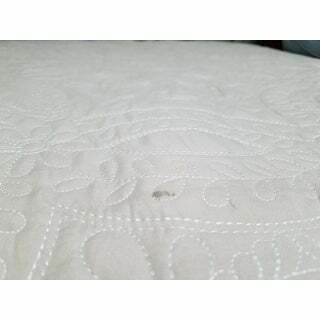 The stitching is well done and it nicely covers our bed which sits high because it's adjustable. The two throw pillows were a bonus. Love the fabric and clean lines of spread, the shams set it off nicely Would order from them again. This is so beautiful! Well made and the size it finally covering my king bed. Has a rich look with the natural color is perfect. Totally changed the look of by bedroom! I love this bedspread set. It’s not as heavy as the comforter sets which is exactly what I was looking for. It is beautiful & compliments the colors in my bedroom! "The description says blue. I want the tan. Does it come in tan?" This item has a blue and a khaki color option. I have good taste and Overstock is the best online shopping. Great reviews and just what I had been looking for. "The description says it is reversible but it shows no pics of the reversed side. What does the other side look like?" "This picture shows a tan and white bedspread but the description says it is blue...what is the true color of this in KING size? Thanks!" This is a beautiful shade of beige with an ivory border.